Located in the eastern region of the Algarve, Portugal, Tavira sits largely on its historical background, which is still today a main attraction for locals and holidaymakers from around the world who come here to enjoy the peaceful feel this fishing town has to offer. 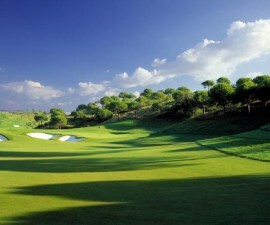 The origin of Tavira dates back to 2000 BC during the Moor occupation of the Algarve. The fishing industry was always the strongest feature of Tavira and one of the reasons it was dominated for so long. 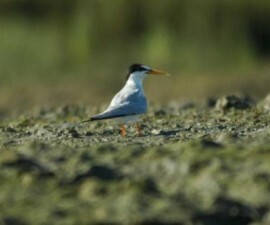 We can therefore stand out a few of the historical and cultural sights one must mandatorily visit while on vacation in Tavira. This is the main centre of Tavira, the riverfront town square where people get together and invite one another to sit and just watch the world go by. Also, this is where many cafés and coffee shops meet, transforming it into a sought-after location to take a walk during the afternoon or go out at night for some drinks in the quiet Tavira. It is said that the Castle might date back to Neolithic times, being rebuilt by the Phoenicians in the 8th century and later taken over by the Moors during the invasion. Located right in the heart of Tavira, the Castle is nowadays a memory of what it used to be for many centuries, mainly before the 1755 earthquake, which destroy it and the city almost completely. 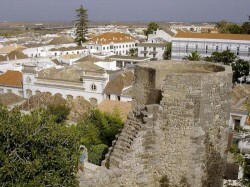 The remaining walls and square towers are mostly climbable, granting an outstanding view over the city’s lovely rooftops and the Ria Formosa Natural Reserve. 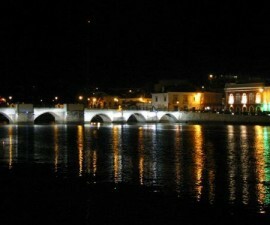 The Roman Bridge crosses the Gilão River from Praça da República, in the city centre of Tavira, with its seven arches of imperative beauty. Although it is called Roman Bridge, it probably predates their era and it is named as such due to the link between Castro Marim and Tavira through a Roman path. Once crossed by cars and people all the same, nowadays it is only crossable by pedestrians and non-motorized vehicles, thus making it a lovely route to cross at least for the view over the river. 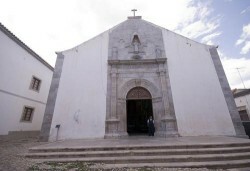 The Church of Santa Maria do Castelo is located in the parish of Santa Maria, being the main church in Tavira. Built in the 13th century on the site of a Moorish mosque and rebuilt after the 1755 earthquake by an Italian neo-classicist, the Church of Santa Maria do Castelo boasts lovely construction lines and a well-preserved Gothic façade. Inside, you can find the tomb of Dom Paio Peres Correia and of the seven knights who were killed during a Moorish ambush and whose death is associated with the conquest of Tavira. 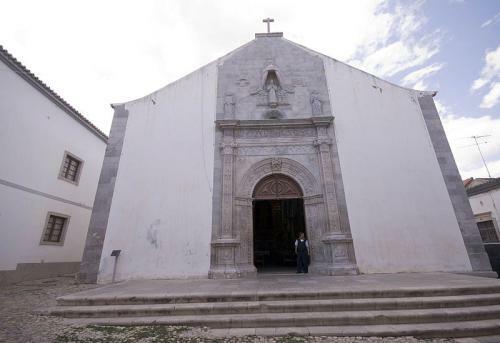 The Chapel of Sao Sebastiao is located in the parish of Santiago and it is said it was erected a number of years before the 1755 earthquake. The Baroque-style of the chapel is probably the most well-known feature of this ancient building. Inside, it is possible to find ten panels of religious art depicting St. Sebastian’s life. 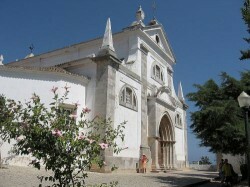 The carvings, statuary, vestments and treasure are also points of interest for those visiting the Chapel of Sao Sebastiao. Also located in the parish of Santa Maria, the Church of Misericordia has been considered to be one of the most astonishing Renaissance buildings in the Algarve, original from the 16th century. The three naves with the roof supported by eight columns complete the façade, whereas the interior decorations display blue and white panel tiles dating back from the 18th century. A stunning example of Renaissance-esque constructions, one of the many scattered through the city of Tavira. Also known as Mercado da Ribeira, the old market in Tavira was built around 1887 and its design has remained the same, although the market has become less and less frequented throughout the years, as people become disconnected from this kind of commercial trade. These days, and after a restoration process a few years ago, it became an historic landmark of Tavira, as it still maintained the original architectural façade, adding up to the town’s background. Set up in the beginning of the 18th century, the Carmo Convent is one of the chief historic monuments in the heart of Tavira, housing a number of events and happenings in and around the building. Inside, you can find paintings, statues, a holy treasure, an organ, and other objects that truly constitute a marvellous example of baroque art in the Algarve region.